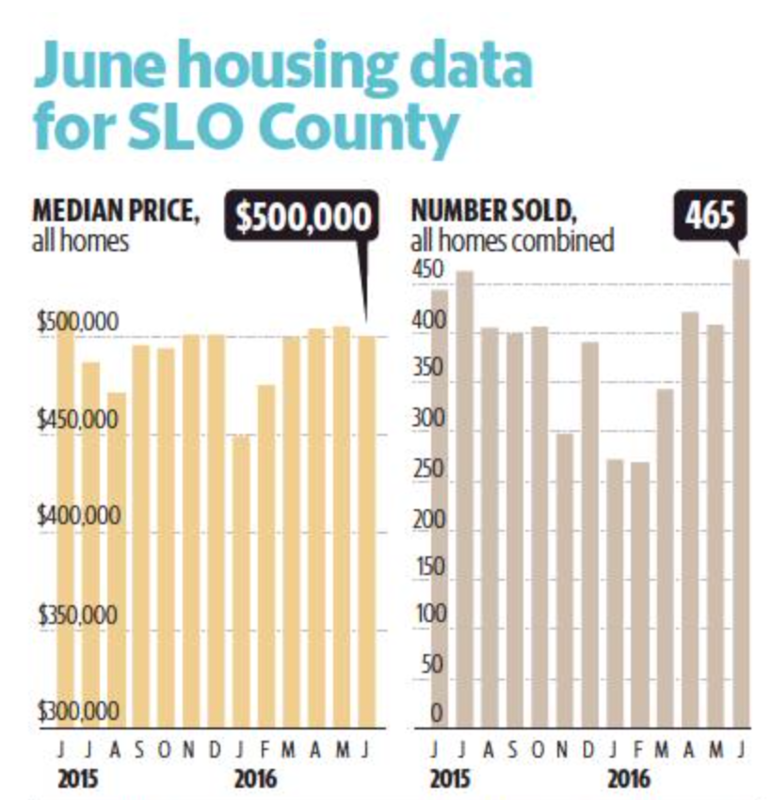 San Luis Obispo County’s median home price dropped in June from both the month earlier and June 2015. The overall number of home sales rose slightly. Total sales — including new homes, resale single family homes and condos — were 465 in June, up 4.7 percent from the same month a year ago, when 444 units were sold, according to Irvine-based data company CoreLogic. The overall median home price dropped 2.9 percent to $500,000 in June, from $515,000 a year earlier. The median is the midpoint at which half of the houses sold for more and half for less. Figures are compared year over year because of the seasonal nature of home sales. California Association of Realtors reported that closed escrow sales of existing, single-family detached homes in the state totaled a seasonally adjusted 450,960 units in June, up 2.2 percent from June 2015. The association reported the median price of a resale single-family detached home in California was $519,440 in June, 5.5 percent higher than the revised $492,320 recorded in June 2015. In San Luis Obispo County, about 75 percent of all sales in June were resale single-family homes, according to Core-Logic. Resale single family home sales increased 1.2 percent to 349 units sold in June from the year-earlier month. The median price of these resale homes dropped by 0.8 percent to $511,000. CoreLogic also monitors sales of condos and new homes, though percentages on those are subject to large fluctuations, because the number of sales is relatively small. The number of condos sold in the county was 60 units, up 22.4 percent from 49 in June 2015. The median price for condos was $390,000, up 2.7 percent from a year ago. Sales of new homes increased by 12 percent in June, with 56 units sold, compared with 50 the previous year. The median price of new homes sold increased by 0.1 percent year over year to $597,000. To read more go to San Luis Obispo's home town newspaper, The Telegram Tribune / www.thetribunenews.com 7-29-2016.